Overall, at 3 out of 5 stars, BioTrust Pro-X10 probiotic is a slightly above average product. There are some qualities that I like about this product, but it also falls short in other areas. I do like the size of the veggie capsules, which are smaller and very easy to get down. You take 1 capsule with breakfast and 1 capsule with dinner. I really like the strain profile with this probiotic; it has a number of well-known and studied probiotics such as Lactobacillus acidophilus and Bifidobacterium lactis. It also contains an extra ingredient called Actazin, which is a standardized kiwifruit powder. Actazin is supposed to help repair intestinal lining that has been damaged by gluten. This company also offers a fantastic 100% money back guarantee; you have an entire year to try out the product! BioTrust Pro-X10 is very expensive. It costs $49 for a bottle lasting one month. On top of the high price tag, you also have to pay $6.95 worth of shipping. You also have to refrigerate this probiotic after opening if you want it to remain at maximum potency. Something that was a big bummer was that I got really bad side effects. For the first week of taking this probiotic, I got a killer stomachache. Thankfully, after about a week the side effects did go away. On the website it does say that this probiotic is supposed to help GI function in a matter of hours instead of days or weeks. Maybe this caused the belly pain. Overall, I like the probiotic strains used, the smaller capsules, and the awesome guarantee but I don’t like the high price tag and unfortunate side effects. 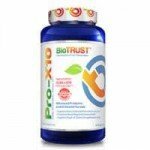 In BioTrust Pro-X10 probiotic, there are a total of 9 billion CFUs in 8 different strains. I really like that they use Lactobacillus acidophilus in the strain profile. Lactobacillus acidophilus has been researched rather heavily compared to other strains and has been shown to help overall health in several ways. This strain can potentially help treat vaginal infections, high cholesterol, lactose digestion, asthma, and diarrhea. It may also help with the symptoms that come along with Leaky Gut Syndrome and Irritable Bowel Syndrome (IBS) such as gas, bloating and constipation. Another probiotic strain that I want to point out is Bifidobacterium lactis. I like the addition of this strain because it has been shown to help boost the immune system and fight off colds and flu. This strain has been shown to potentially help digest macronutrients, fiber, and sugars. Bifidobacterium lactis may also help with the symptoms from Ulcerative Colitis and Celiac Disease. This probiotic does really well regarding allergy concerns. The only potential allergen is YEAST in the form of Yeast Saccharomyces boulardii. These capsules are FREE of egg, dairy, fish, crustacean shellfish, tree nuts, peanuts, gluten, wheat, and soy. As a perk, the capsules are veggie capsules. Other ingredients in Pro-X10 are: microcrystalline cellulose, vegetable hypromellose, vegetable stearate and silica. For a 60 capsule bottle, it costs $49.00 (plus $6.95 for shipping). Since you take 2 capsules daily, it ends up being $1.63 a day or $1.86 if you include shipping. $49.00 to almost $56.00 after shipping is pretty ridiculous for only a month’s worth of probiotics. I think this probiotic is very expensive and there are better values out there for the money. I did get some pretty intense side effects from taking Pro-X10. It was the most noticeable the first 3 days of taking it. My belly was in a lot of pain. The pain did calm down and then eventually went away after about a week of taking the product. BioTrust has one of the best satisfaction guarantees that I’ve seen so far. You have an entire year to try the product and if you aren’t 100% satisfied, you can get your money back! I really commend the company for having such a great satisfaction guarantee. To buy BioTrust Pro-X10, click here. Allergy Concerns No allergy concerns other than YEAST. Side Effects I did get belly pain while taking the capsules.